In the Caribbean, Trinidad and Tobago is most reliant on energy for national revenue – currently accounting for around 32% of the country’s gross domestic product (GDP) – as opposed to tourism, which is the mainstay of most other Caribbean island economies. The country has seen its fair share of challenges in recent times based on its significant reliance on energy sector revenues. 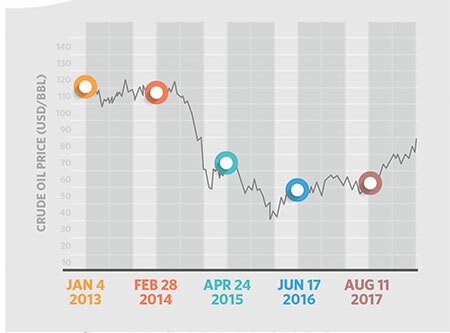 Not only from the precipitous fall in commodity global prices – prices fell from almost US$120/barrel in January 2013 to below US$30/barrel by the end of 2015 – but also due to falling domestic production levels. According to the Finance Minister, for the first five months of 2017, production had levelled off at 73,500 barrels per day (bpd), as compared with the 100,851 bpd in the corresponding period for 2010. Energy sector revenue, which peaked at $28 billion in 2008, fell to $1 billion in 2017. Indeed, there has been renewed interest and investment in energy exploration across the Caribbean. Prime Minister Dr. Mitchell, indicated that hydrocarbons were found in “huge commercial quantities” by Global Petroleum Group (GPG), a little-known Russian company near to Grenada’s maritime boundary with Venezuela. Minister with responsibility for Energy, Senator Darcy Boyce stated that Barbados had successfully negotiated exploration licences for two blocks within BHP Billiton and had awarded another block to Repsol. British firm, Tullow Oil Limited, has signed an agreement to pursue 3D seismic surveys of Jamaica’s south coastal seafloor as part of the island’s efforts to discover oil and gas in conjunction with the Petroleum Corporation of Jamaica (PCJ). Oil exploration has stepped up significantly following ExxonMobil’s major discovery of more than 3.2 billion oil-equivalent barrels of recoverable resource on the Stabroek block, not including other more recent significant discoveries. As stated by Exxon, first oil is to be expected by March 2020, with production forecasts in excess of 340,000 bbls/day by 2022. All this notwithstanding, Trinidad and Tobago continues to be an important oil and gas producing hub in the Caribbean and Latin American Region with major multinational energy giants, such as bpTT, Shell, BHP, EOG Resources and Perenco which continue to maintain a presence in the country. In Trinidad and Tobago, 99.8% of power generation is fuelled by natural gas and 0.2% by diesel. Further, T&T has the largest Liquid Natural Gas Train in the Western Hemisphere, and a number of industries, including ammonia and methanol, which are founded upon natural gas. Indeed, Trinidad and Tobago has been involved in the petroleum sector for over 100 years and is still the largest oil and natural gas producer in the Caribbean. Trinidad and Tobago’s evolving challenge, is not only to optimize its domestic production and commercial outcomes based on its own domestic production, but now also be cognizant of the booming interest in the regional energy space. Trinidad and Tobago must become more engaged and market its expertise and energy competence in proactive and synergistic ways which will assure the country’s long-term economic prowess long after its own domestic energy reserves are depleted.